Germany is a third-tier rugby union playing nation. Germany currently plays at the second level of European rugby but has never qualified for the Rugby World Cup. The national team first played in 1927, with rugby union in Germany being administered by the German Rugby Federation (Deutscher Rugby-Verband). Germany's declared aim was originally to qualify for the 2015 Rugby World Cup in England, but it has since lowered this ambition to the 2019 Rugby World Cup in Japan. 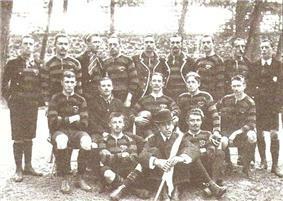 The German rugby union team's history began on 17 April 1927, when they played France in Paris, losing 5–30. The team established itself in their early years as number two in continental Europe, behind the French. They played 14 tests against their neighbour before the Second World War, winning two of them. As an indication of the team's strength, they did not lose to any team but France until 1937, when Italy beat them 9–7. Because Germany never played any of the Home nations, it is difficult to judge the true strength of the team from that era. After a disappointing first half of the campaign, where Germany only won one of its five games, the team improved and won three in the second half, consequently finishing fourth overall out of six teams. With the final game against Moldova, Germany's captain Alexander Widiker played his 50th game for his country, thereby equaling Horst Kemmling's record. Germany again competed in the European Nations Cup First Division B in 2012–2014, once more facing Poland, Moldova and the Czech Republic. Additionally, it also competed against the Ukraine, relegated from the A group, and Sweden, promoted from the Second Division. Germany's first match was on 27 October when it played Ukraine at home. Before that the team played an unofficial warm up match against the New Zealand Ambassador’s XV on 13 October 2012, a team that featured former All Black Keith Lowen in its ranks, and ended in a 22–20 victory for Germany. Schippe was replaced by his assistant Kobus Potgieter as coach of the German team. Germany started the autumn of 2013 with two wins in friendlies against the B team of the Czech Republic and the New Zealand Ambassador’s XV, the later with former All Black captain Taine Randell in its ranks. It then won its away match against the Ukraine before winning at home against Poland, thereby taking back the lead in its division. Germany lost its last game of 2013, 15–30 to Moldova, but won comfortably 76–12 against the Czech Republic in April 2014. This game was to be the 58th and last for German captain and record international Alexander Widiker as he retired from international rugby after that. Germany's last game of the 2012–14 campaign was against Sweden on 26 April where a bonus point win would guarantee the side the championship, promotion and an advancement in the Rugby World Cup qualifying. Germany won the game 45–20 to advance to a play-off game against the Netherlands in the 2015 Rugby World Cup – Europe qualification, which they won 17-7. They played Russia for a chance to qualify for the Repechage and lead 20–17 up to the 77th minute but eventually lost 20–31 and were knocked out of the qualifying. Germany played two warm up matches in 2014. 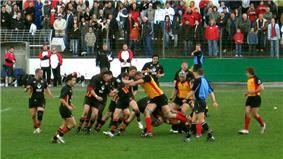 Germany played a match against the New Zealand Ambassadors XV which it won 21–19. Germany then lost to Namibia 58–20. ^ "Deutscher Rugby-Verband - DRV - DRV XV". rugby-verband.de. ^ "Live rugby 2015 - Aviva Premiership 2015 - Rugby Union fixtures and news". ESPN UK. ^ "Arthur Zeiler". ESPN scrum. ^ a b "TotalRugby - Spielerinformationen - Marcus Bender". totalrugby.de. ^ a b "TotalRugby - Spielerinformationen - Benjamin Danso". totalrugby.de. ^ "TotalRugby - Spielerinformationen - Rafael Pyrasch". totalrugby.de. ^ "TotalRugby - Spielerinformationen - Ansgar Ruhnau". totalrugby.de. ^ "Clemens von Grumbkow". ESPN scrum. ^ "TotalRugby - Spielerinformationen - Clemens von Grumbkow". totalrugby.de. The following players are part of the German team as of November 2014. The performance of the German team since introduction of the European Nations Cup in 2000.